Budo must be like a double edged sword, kindness and strictness. When you get stronger, you also naturally get kinder. Back in the era when swords were considered essential, "Bunbu Ryodo" (the twin paths of the sword and the pen) was a requirement for the elite. Rephrasing it in more modern terms, it would probably describe a student who gets good grades and also excels in sports. But there is a difference between sports and budo. Generally speaking, people's image of sports is healthy. Working up a good, satisfying sweat. Budo also has this quality, but behind that there is the sense of death. Unlike sports, if one "loses" in a confrontation, it can mean death. So there is a kind of omote (surface) and ura (behind the surface). This is the origin of budo. However, one cannot bring this to the surface. So many of today's budo are becoming mere sports. Tournaments and matches are the omote aspect, a kind of competition to show the efforts of one's practice. The ura aspect is not for show, but the pursuit of only victory. If you said this you might give an impression of brutality, but if your technique doesn't work in a real confrontation, why even bother with budo? If one doesn't have the confidence to defend oneself, which is the original purpose of the martial arts, then one will just get swept away. There seem to be a lot of people who do not understand this, and open their dojos just on a whim. That is why at our dojo, we teach not only the techniques, but also the true purpose and history of budo to the beginners. They seem to improve rapidly. If we just have them learn by mimicking the instructors, it becomes too easygoing. On the other hand, it is best to turn away those who come to learn for sinister purposes. I am referring to those people who, no matter how well we teach them, always seem to go off on a dangerous tangent. Budo is not for those kind of people. Real budo is not an offensive art, but rather teaches the importance of courtesy, love and kindness. But, if it comes down to the line, one must not forget the feeling of an eye for an eye, a tooth for a tooth. Budo is thus a double edged sword, strictness and gentleness. Through budo one also gains much more than just muscular strength by "growing strong." If one is weak, one will constantly be running away (from challenges), showing nothing but his back to others. In order to face forward and press on, one must become strong. By growing strong, one also grows compassionate. I think that budo is very useful for widening one's mental perspective. People also say that the martial arts are a way of relieving stress, but the idea is too fixed in some people's minds. They can also be harmful. Budo seems to have two sides to everything. The two sides are not separate, but the plate of budo seems to be big enough for both extremes. It depends on how you use it. When your are exhausted, for example, you shouldn't exercise. Also, if you brood over exercising, this adds stress rather than reducing it. In these circumstances it is best to practice Taijiquan or soft Qigong. They can be done while relaxing and they help reduce exhaustion. 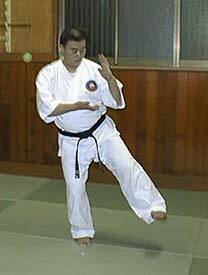 Uematsu Yoshiyuki (Tesshu) is Chief Instructor of Mushinkan Karate Kobudo Dojo in Kanazawa, Japan. 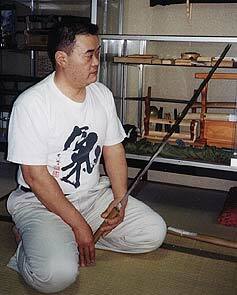 He also teaches iaido and is an accomplished painter, calligrapher and woodcarver. At age 9 he began Zen training at Shofukuji Temple in Saga Prefecture, where his uncle Mori Goho was the head priest. He began training in budo the next year, also under Mori, who taught Shoreiryu Karate Kobudo as well as classical Japanese martial arts. He entered the Sojiji Temple in Monzen, Ishikawa Prefecture in 1971, and at age 24, opened the Mushinkan Dojo and has worked to promote budo in Ishikawa Prefecture.